This vintage-inspired holiday card will delight your friends and family! 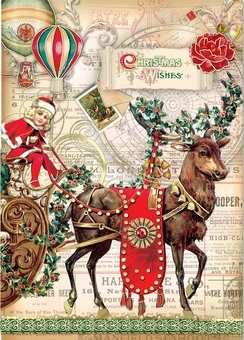 A child dressed like Santa perches upon an ornate sleigh. The sled is pulled by a majestic reindeer, outfitted in gold harness and red finery. Holly leaves and berries drape across the deer's antlers and over the sleigh. Gems and gold foil add a shimmer, and the phrase "Christmas Wishes" is written upon the front.